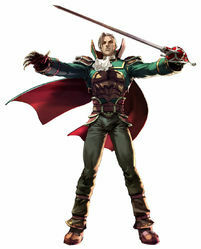 Raphael first appeared in Soulcalibur II (from the Soul series). He is from a noble French family and is a vampire (thus, he does not age). He is read as a gay character, but other reviewers insist that he is simply flamboyant. As vampires are often queer characters, queer readings are understandable, but there appears to be no clear evidence of his sexuality in the game. You can see Raphael in action in this video. Superweapon667. (2009, January 25). Soul Calibur II: Raphael. This entry was posted in 2000s, Playable Character, Queer Men, Queerly Read/Rumored on September 2, 2015 by Adrienne Shaw.